The groundbreaking 2019 911 GT3 RS has just been unveiled, and its looking quite impressive. Theres lots of numbers and materials being thrown around, but what do they all actually mean? We’ll break this stunning automobile down for you in terms that make sense to the casual automotive enthusiast. No editorial on a GT3 would be complete without a section dedicated to it’s powerplant, and what a powerplant it is. Displacement in the facelifted RS remains unchanged at four liters. Now, you might be thinking to yourself “Wait a minute, the 2016 GT3 RS had a four liter, why is everyone so excited about the 2019 model?”. Well, displacement isnt everything. Plasma coated cylinder liners, central oil supply through the crankshaft with larger bearing diameters, larger connecting rod bearings and the rigid valve-train with shims to provide valve clearance compensation, are all improvements carried over from the standard 2018 GT3. This means a redline somewhere north of 9,000 rpm. Yes you heard right, it’s over 9000, making it the highest revving RS of all time. This translates to 20 additional horses, bringing the peak to 520 hp. For reference, the naturally aspirated GT3 RS now has an equivalent power output to the 2016 911 Turbo. The PDK will remain the only available gearbox in the GT3 RS, due to its principal focus on laptimes, over the maximum driver involvement championed by the 2018 GT3 which was available with a manual transmission. 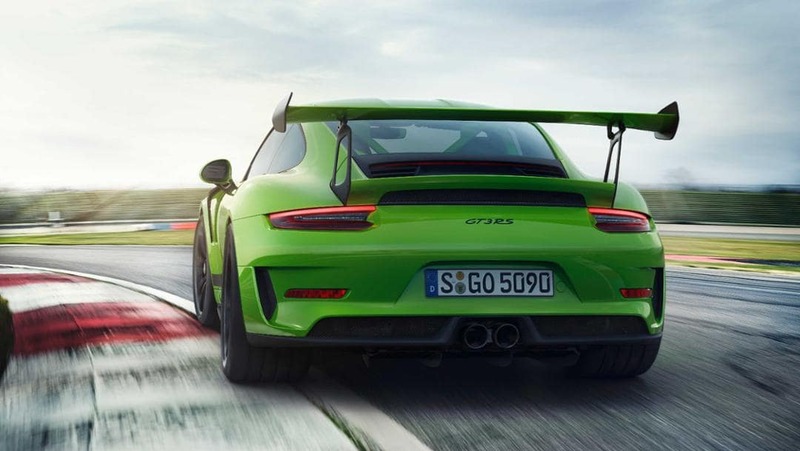 New NACA ducts inspired by the 2018 GT2 RS, are featured on the front trunk lid for optimal brake cooling, while maintaining minimal aerodynamic drag. A larger front spoiler lip and side skirts work in conjunction to develop even more downforce. What does this all equate to? Well, at 124 mph it equates to more than twice as much downforce as the 2018 GT3. The aerodynamic bodywork is truly aggresive in appearance, and coupled with the new Lizard Green paint option, it looks downright menacing. Now we get to the real bread and butter of the GT3 RS, the chassis and suspension. Porsche Active Suspension Management (PASM), active engine mounts, rear axle steering, and variable electronic locking rear diff with Porsche Torque Vectoring Plus (PTV+) are all standard. New for the 2019 model are ball joints on all suspension links, rather than conventional bearings with rubber bushings, which will provide even greater precison. New helper springs assist the front axle, and will remain in the rear. Forged lightweight wheels will be standard, measuring 9.5 x 20 up front, and 12.5 x 21 in the rear. Both will be fitted with brand new ultra high performance variants of the Michelin Sport Cup 2 tire. Cross-drilled cast iron rotors will remain standard, however the car may be outfitted with the massive, lightweight Porsche Ceramic Composite Brake system (PCCB) as an option. Last but not least, for the first time ever on a GT3 will be the inclusion of an optional Weissach package. Designed for additional weight saving, the Weissach package will include carbon fiber sway bars and coupling rods, roof, steering wheel trim, shift paddles, and steering wheel, saving 13 pounds altogether. Forged magnesium wheels are also optional, weighing 25 pounds less than the standard spec wheel. 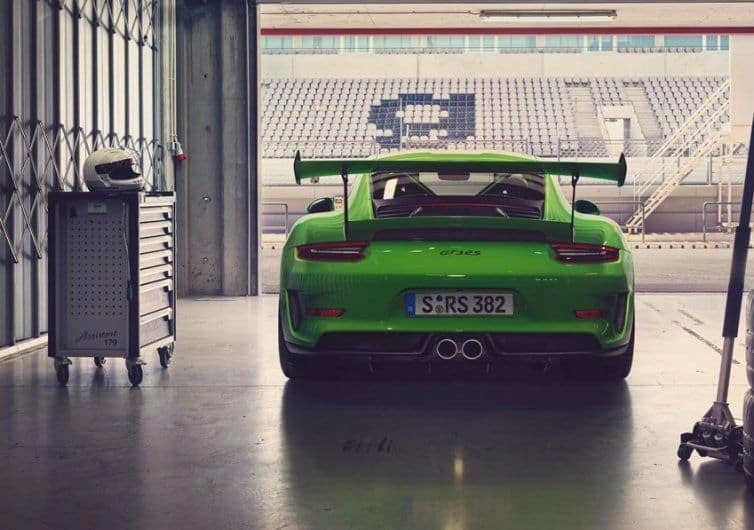 Hopefully you’re as excited for the new GT3 RS as we are. The hype is real.